Pumpkin is everywhere. It’s delicious, nutritious, and easy to come by. But can dogs eat pumpkin, too? While you’re sipping on your favourite pumpkin spice latte, can your dog savour his own pumpkin treat? Turns out, the fall staple is not only a great treat for people (minus the sugar and pastries, perhaps), but it makes an excellent treat and supplement for dogs. If you look at the nutritional information for one cup of cooked pumpkin (USDA Nutritional Database), you can see that pumpkin is low in calories, but rich in a host of essential vitamins and minerals. Pumpkin, the orange beauty that it is, contains a high concentration of vitamin A (beta-carotene). It also contains a lot of potassium, which helps regulate blood pressure, improves muscle health, and assists in metabolism. It also contains smaller amounts of a variety of healthy nutrients, including Vitamin C, Iron, Phosphorus, Magnesium, and Folate, to name a few. Vitamin A is essential for your eye health, and it’s no different when it comes to your dog. Vitamin A promotes eye health and the development of night blindness and other eye degeneration. Since Vitamin A is fat-soluble, feeding your dog pumpkin with a little healthy oil will make the nutrients pack more punch. Mix your pup’s pumpkin on top of his regular food, or mix in a little flax oil for a healthy, satisfying treat. Vitamin C is integral for immune health all-around. When combined with vitamin A (beta-carotene), E and other antioxidants in pumpkin, it can possibly help prevent certain cancers from developing. Antioxidants help destroy free radicals, or “oxidants” in your pet’s system, like yours. While oxidants are a natural part of everyone’s immune system, too many oxidants can contribute to cancers and damage the body. Boost your pet’s immune system by including fresh sources of antioxidants, such as those found in pumpkin. A number of nutrients in pumpkin, including vitamin A and zinc, improve your pet’s skin and coat. The high water content in pumpkin flesh also contributes to supple skin and a lustrous coat. In addition to making your pet’s coat shine and look fantastic, the added moisture causes the skin to flake less and less hair to be shed on your carpets, furniture, and clothes. Don’t just look to the pumpkin flesh for your pet’s health – give him a taste of the seeds, too! Pumpkin seeds and flesh contain antioxidants and the seeds in particular contain a healthy dose of Omega 3 fatty acids. These fatty acids have anti-inflammatory properties, which can help dislodge kidney stones. In addition, pumpkin seed powder is known to prevent urinary incontinence, which is the reduced ability to hold in urine. A sign of your dog’s good health is whether he is pooping normally. Hard stools or those that are difficult to pass put strain on your dog’s intestines. Adding a little pumpkin to your dog’s diet supplies the necessary fibre to enable your dog to pass stool easily and cure constipation. Though it may defy understanding, pumpkins have the unique ability to cure both constipation and diarrhea in your dog. 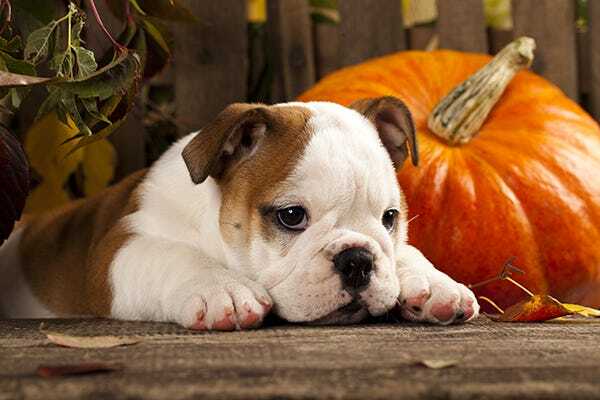 If your pet’s stool is a little loose, a little pumpkin can add bulk and form to your dog’s poop. Parasites, such as tapeworms, can wreak havoc with your dog’s digestive system and cause unpleasant symptoms including weight loss, nutrient deficiency, dry skin, and a shabby coat. Pumpkin has high amounts of an amino acid cucurbitacin, which is actually toxic to many common dog parasites and has been used to expel worms in ruminating animals. Grinding up a teaspoon or two of pumpkin seeds and mixing into canned food (or a little canned pumpkin!) is a good preventative measure, but don’t skip out on your pet’s usual treatment. Pumpkins have a high moisture and fibre content, which makes them a powerful tool for your pet’s weight loss. Replacing a little of your dog’s regular food with canned pumpkin (a few teaspoons for a small dog up to half a cup with a large dog) can help your dog lose some excess weight. The fibre and water in the pumpkin will keep them full, so they don’t miss the extra calories. Many dogs fed a kibble only diet suffer from a mild, but chronic dehydration. Dry dog food has a very low moisture content and dogs do not possess a very strong thirst drive. This means that getting extra moisture into your dog through drinking can be difficult. 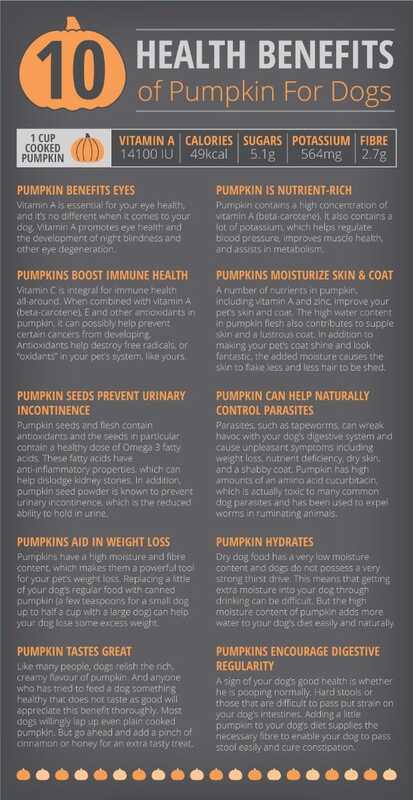 But the high moisture content of pumpkin adds more water to your dog’s diet easily and naturally. Like many people, dogs relish the rich, creamy flavour of pumpkin. And anyone who has tried to feed a dog something healthy that does not taste as good will appreciate this benefit thoroughly. Most dogs willingly lap up even plain cooked pumpkin. But go ahead and add a pinch of cinnamon or honey for an extra tasty treat. How Much Pumpkin Do I Feed My Dog? While pumpkin can be a fantastic addition to your dog’s complete diet, it’s important that you feed the correct amounts. It’s unlikely that your dog will overdose on any natural nutrient by consuming too much pumpkin, but if your dog eats too much pumpkin, it could lead to a nutritional deficiency somewhere else, or could mean your dog is getting too few calories. Generally, 1 tsp of canned (or cooked and pureed) pumpkin per 10lbs of body weight per day is a good standard to go by. If your dog has a health condition such as diabetes, please talk to your vet before feeding pumpkin to your dog. As a general rule, treats (including fruits and vegetables) should never exceed 10% of your pet’s daily caloric needs. Pumpkin seeds are high in fat and should be fed more sparingly. 1 ground up pumpkin seed per 10lbs of body weight per day is a safe amount. For puppies and very small or underweight dogs, only feed pumpkin in very small amounts as a treat. How Do I Serve Pumpkin to My Dog? Pumpkin can be enjoyed by your dog in a variety of ways. There are many pumpkin treats, canned foods for dogs containing pumpkin, and pumpkin supplements that can easily be fed to your dog. For their safety, ensure that you feed your dog only supplements and treats that are designed with dogs in mind. Simple canned pumpkin can also be fed to your dog, but be careful not to feed pumpkin pie filling or any canned pumpkin with added sweeteners or spices. Cans should be good for 3 or 4 days in the refrigerator, or portion out and freeze in individual servings for a longer lasting alternative (ice cube trays work perfect). Store these properly to avoid freezer burn, which can affect taste and nutrient density. You can also make your own dog treats from canned pumpkin, but ensure that you include only safe ingredients for dogs in your recipes. You can also feed your dog cooked pumpkin that you make at home. Prick a few holes in a pumpkin and bake at 350F for 45-60minutes. Cube or puree for a tasty, home-cooked dog treat! While raw pumpkin is safe for dogs, the flavour and texture improves with cooking. Pumpkin seeds can be consumed raw by your dog, but your dog will probably enjoy them more when they are dry roasted. Avoid salting or adding oils to pumpkin seeds that you give to your dog. Fatty, rich foods can cause a life-threatening condition called pancreatitis in dogs. Clean, rinse, and dry out pumpkin seeds after you scoop them from a fresh pumpkin. Roast pumpkin seeds with no oil or salt on a baking sheet (with parchment paper to prevent sticking) at 350F for approximately 10-15 minutes. Cool and treat your dog (see serving suggestion above).